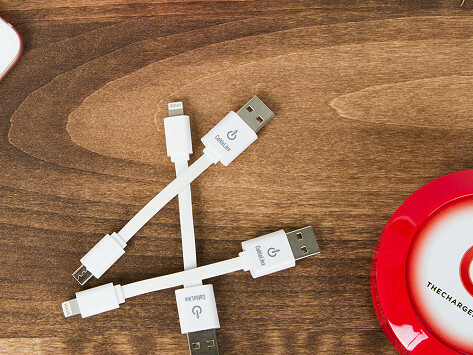 CableLinx Charging Cables are a modern, flat design made to be sleek and convenient. Charge any micro-USB or lightning device with your ChargeHub. Dimensions: 4" x 0.63" x 0.25"
While these little suckers work they are so darn short they are awkward to use. Waste of money. 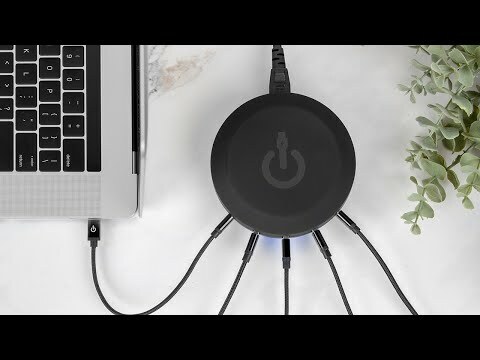 Get your cords in order with ChargeHub™, a one stop charger that powers up to seven electronic devices simultaneously, at full speed, with just one plug. Perfect for families or anyone with multiple devices, the cross functional USB ports can fuel phones, cameras, and tablets. ChargeHub is created by Rock Smeja and his family. Rock is a third generation roofing and sheet metal contractor and entrepreneur from Illinois. His company, Limitless Innovations, specializes in developing technology accessories that are innovative and efficient. This universal docking station is their first product. It eliminates the need for cables, wires, and power strips for a less cluttered, more organized space. Enabled with “Smart Speed” technology, ChargeHub can individually calibrate energy needs for each device. A blue LED light indicates power and function, while providing a soft underglow so you can see it in the dark.